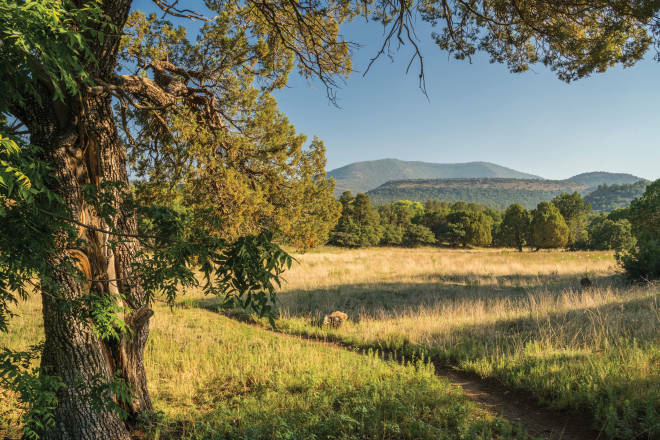 Excerpted from Laurence Parent’s Hiking New Mexico (4th edition available this spring, FalconGuides/Rowman & Littlefield). Above: The state&apos;s largest alligator juniper awaits hikers near Silver City. THE TRAILHEAD: Take the Fort Bayard turnoff on US 180 in the village of Santa Clara, about 7 miles east of Silver City. Drive north to the fort. Follow signs for FR 536, which enters the national forest about 1.6 miles from US 180. FR 536 reaches a Forest Service work camp at 4.5 miles. Go left at the entrance and follow the sign for the National Recreation Trails; park in less than 0.3 mile. WHAT YOU’LL SEE: The Big Tree Trail heads west, then turns northwest after crossing a small canyon. Go through a gate at about 1 mile and then a marked junction with Woodhaul Wagon Road Trail 55. Cross that trail and continue northwest. At 1.3 miles, Cornell Ranch Trail 758 forks off to the left. Stay right and drop into a large grassy meadow with nice views. The trail passes through shady bottomland wooded with box elders and other trees. At 1.75 miles, you’ll reach a massive alligator juniper with deeply checkered bark. Take a break at a shady picnic table. Return the way you came. This trail is also popular with mountain bikers.